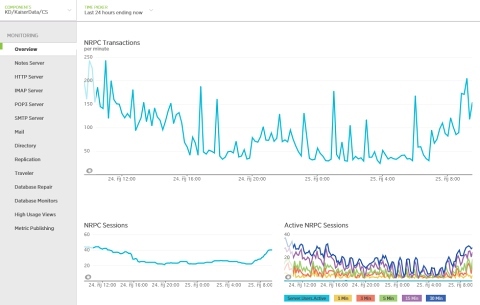 IBM Domino 10.0 you can set up Domino to publish Domino statistics to an external monitoring service via New Relic . You can publish Domino statistics to New Relic, a third-party, web-based monitoring application. New Relic allows you to visually monitor statistics in real time on multiple Domino servers from one dashboard. This statistics are reported through a New Relic plugin called DominoStats. Statistics are published once a minute and are retained for 24 hours. The Domino Stats Plugin New Relic is FREE with limited features. add a setting to the server notes.ini file to enable the server to report its statistics. Create an account at www.newrelic.com. Click the arrow at the top, right of the New Relic window and select Account Settings. Copy your license key in the License key field. Wait a few minutes for the initial metrics to be published. A summary page that you see when you open the plugin reports key monitoring statistics for each server that you have configured to report to New Relic.